I received the following products complementary from Influenster for testing purposes. All reviews are my own honest opinions. Lately I have been thinking more and more about healthy living and the fact that sometimes what my family and I tend to put in and on our bodies, may in fact not be really good for us. I have thought about the whole eating "healthy" when we go to a fast food joint, but then I realize that ordering something that is considered to be healthier for you than the regular double cheeseburger with extra pickles that I usually get, is just way too expensive. And then for like the past year, I have been ordering chicken- in hopes that it's just that much better for my body, and digestive system. Sure I feel so much better, and now barely eat "cow". Now, if I could just get off this pop kick, I'm on, I would be good. Anyways, switching to chicken is one thing, but I wanted to take it a step farther and try out the "all natural, no additives or preservatives, organic, gluten free" type of food. But I didn't know where to start, and I really didn't want to spend a crap ton of money on something that I would wind up hating. Then Influenster sent me an e-mail and my problems were solved. They told me that I was officially a part of their new #rockthelunchbox campaign- basically you get a bunch of "health foods" and become awesome for it. Yeah, I was kinda stoked. 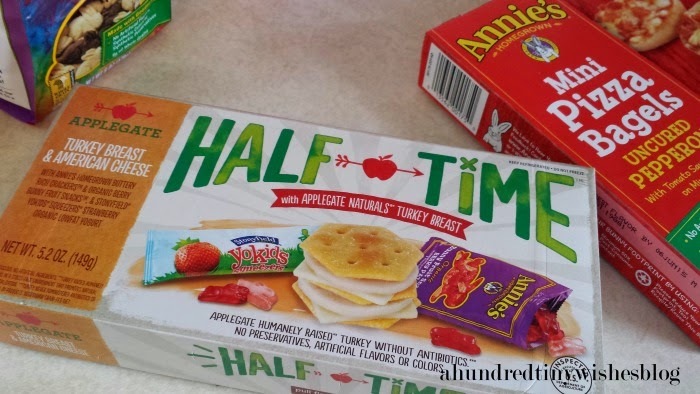 Through Influenster, I was able to try Annie's Homegrown Mini Pizza Bagels & Friends Bunny Grahams, Applegate Half Time lunch, and Honest Kids Organic Juice (in berry lemonade). They also sent me a coupon for Rudi's Bakery Bread, but I wasn't able to find Rudi's at Target. 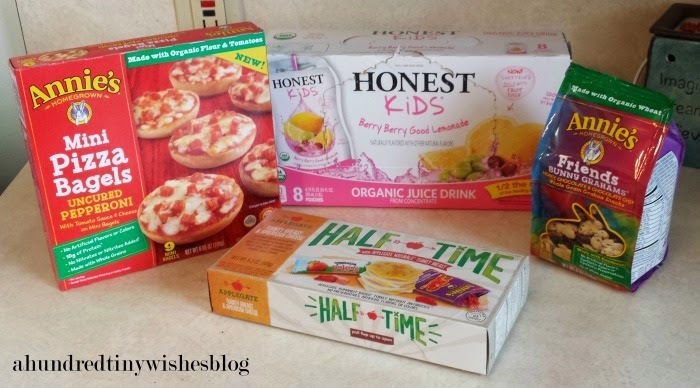 My son loved the Honest Kids Berry Lemonade- He actually has drank the whole box. Unfortunately, I was not a fan. I found it to taste like a flavored water. 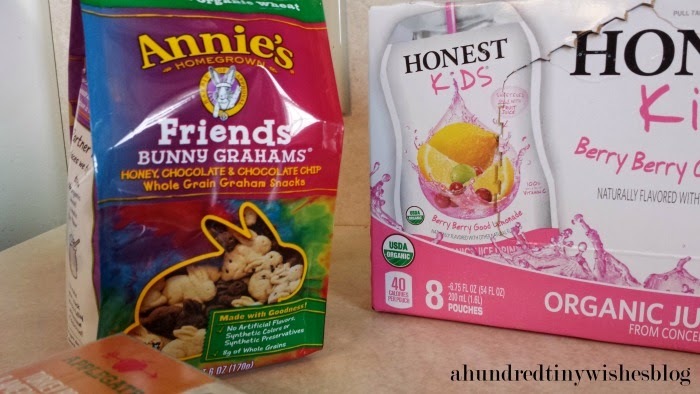 I felt the same way with the Annie's Friends Bunny Grahams- my son loved them, but I hated them. After eating three or four, I actually wanted to throw up. Sad, but honest. On the other hand, I actually liked the Mini Pizza Bagels. 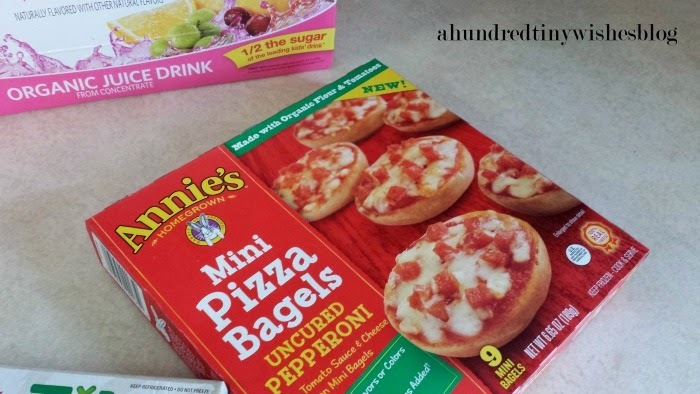 They didn't taste like the regular pizza bagels I'm used to, but they didn't taste horrible. I would definitely recommend them as an introduction into organic and healthy food. I also liked the Half Time lunch. I took it with me to work, and It was really good (although I didn't eat the gummies or yogart- it's for my son). So, I am quite sure if organic and healthy products are for me, just yet. I really think that it would be an all or nothing approach and definitely a lifestyle change. Which we aren't ready for just yet. Have you ever tried organic or healthy foods? I love your honesty. Thank you so much!! your honesty is the best thing about this. It's really good to know if something isn't going to taste great. I'm hoping to get these coupons as well. It seems like I can do the organic and "healthy" foods more than gluten free. I have issues with taste sometimes. I will be definitely checking out your post!